1/9/2017 Clemson battles Alabama in the CFP National Championship Game presented by AT&T! 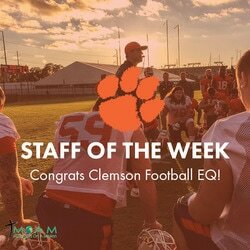 MOAM is proud to announce Clemson Equipment Manager Abe Reed and his Student Manager Staff as the final 2016 Equipment Staff of the Week. The Clemson Equipment Staff certainly couldn't ask for a better finish to the season, but it should be noted they overcame their fair share of challenges from start to finish this season. Late summer transitions moved veteran Equipment Manager DJ Gordon from the Equipment Room to the Assistant Director of Football Operations position. Then to finish the season Clemson completed essentially 2 Bowl Games in back to back weeks as they won the Fiesta Bowl in Arizona, and then played in the College Football National Championship in Tampa, FL the following week.